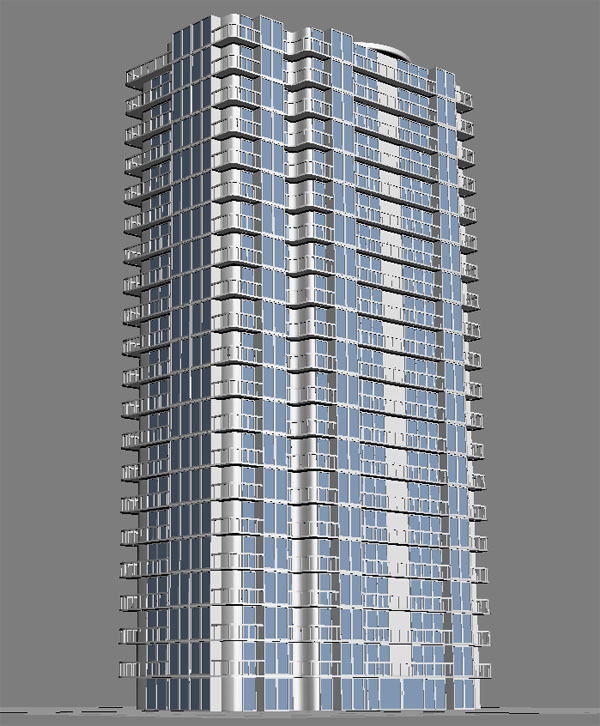 In this tutorial i will teach you how to model a high definition building in 3ds Max 9 . 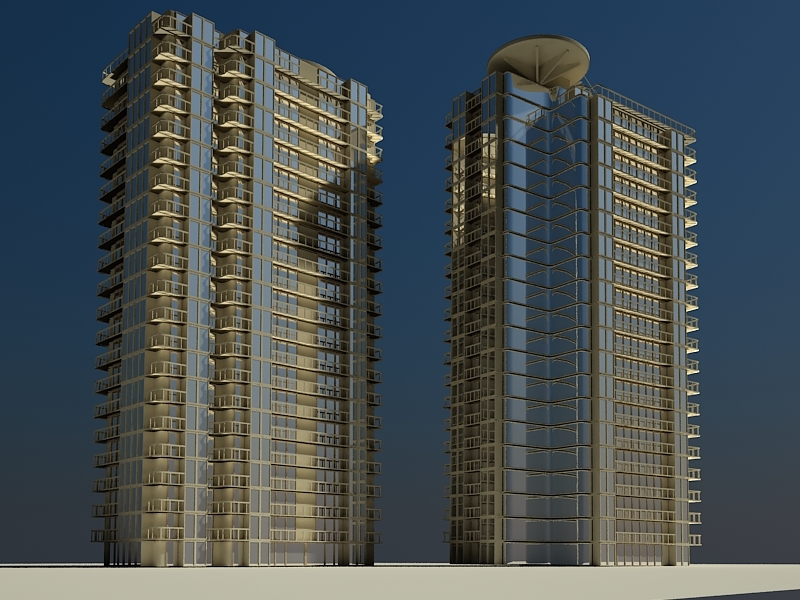 For this tutorial you need to have a 3dsmax 9.
and download some high resolution images of buildings. basic floor plane Length: 480 and Width: 640 . 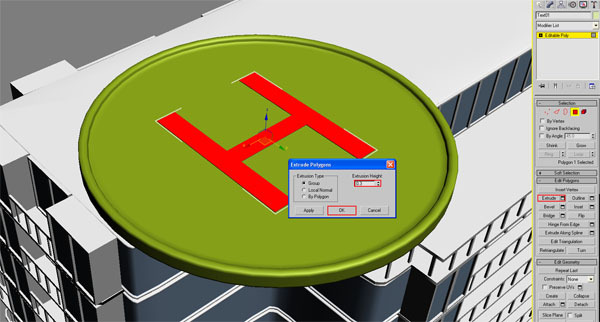 Step 2:Open the material editor >select any material slot and add the basic floor plane image in it.. then apply this material on this the basic floor plane . 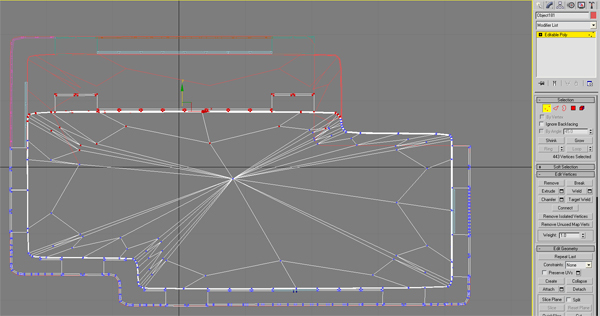 Step 3:go in Shapes> select Line and start. 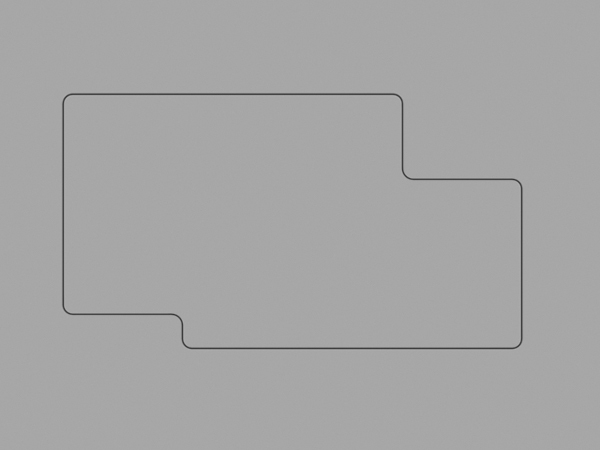 Step 4:now start making the line as shown in our basic floor plane just follow the basic floor plane lines . 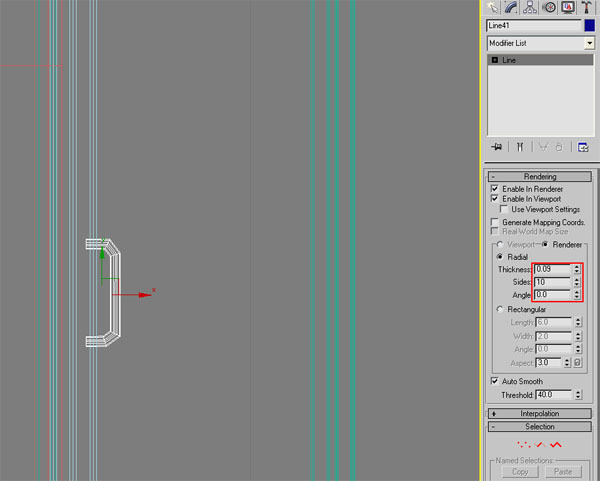 Step 5:right click on the line and then convert it to Editable Poly. 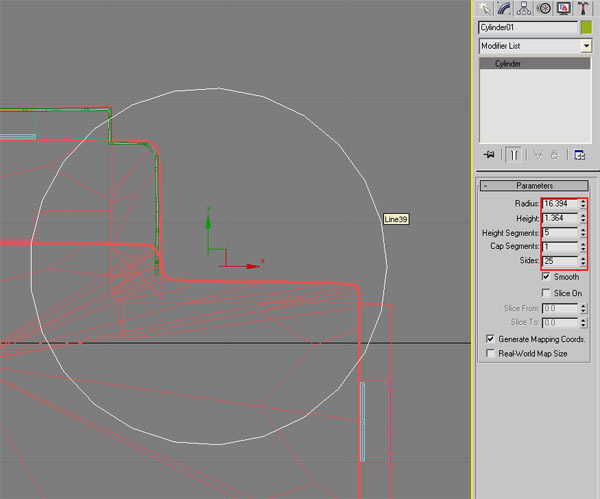 Step 6:after editable poly ,lines look like as poly mesh . Step 7:go to Polygon >select the polygone . 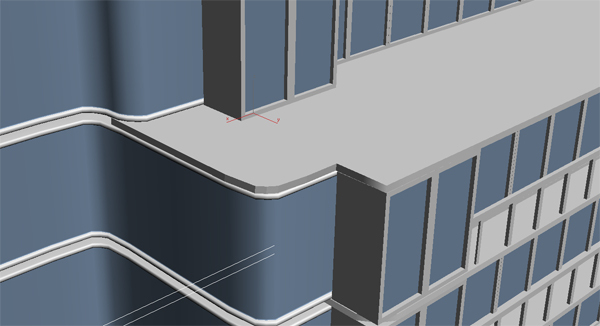 Step 8:Extrude it to: 48.152 .
copy of our ground floor this copy will be use in making of our other floors of building. 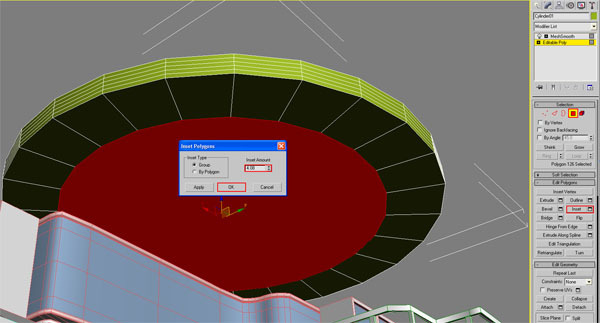 go to Edit >Clone> now choose Copy option and click ok.
on the object and choose Hide Selection. now need to fill it it. 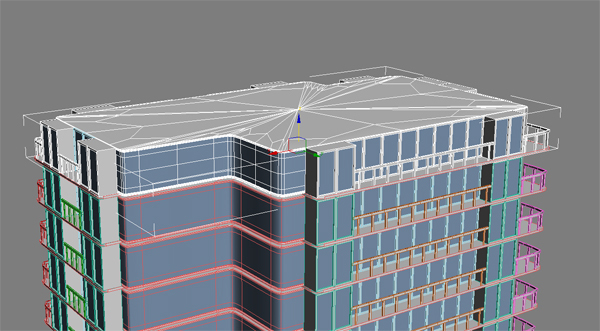 go to Editable Poly>Border>select the ground floor bottom edge. Step 12:go to Edit Borders >click on Cap. 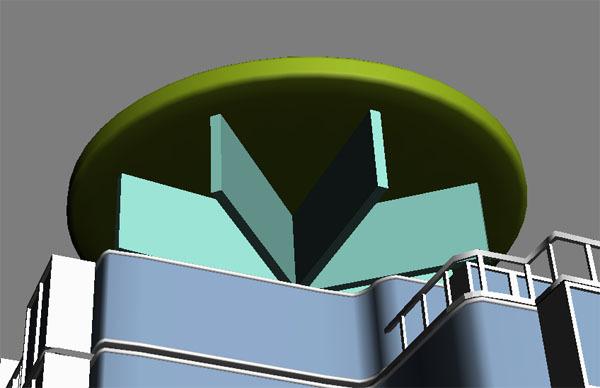 Step 13:go to Editable Poly>Edge>select the top and bottom edges. 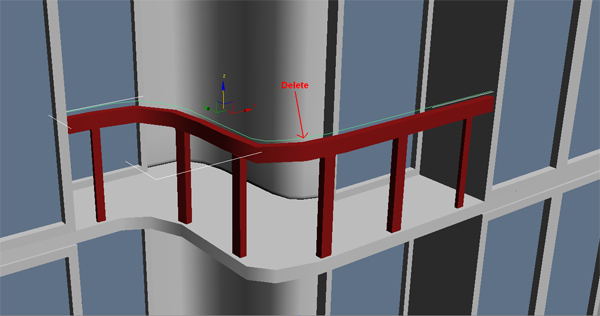 Step 14:go to Editable Poly>Edge>click on Chamfer set (0.394 ). 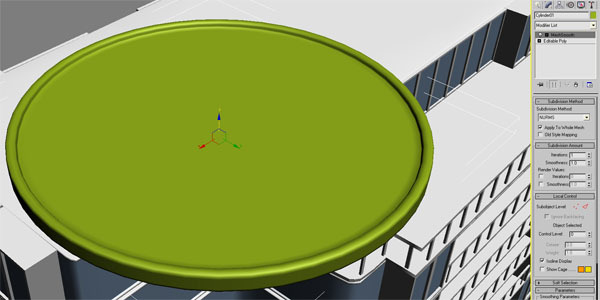 Step 15:open Modifier List and select the Mesh Smooth . 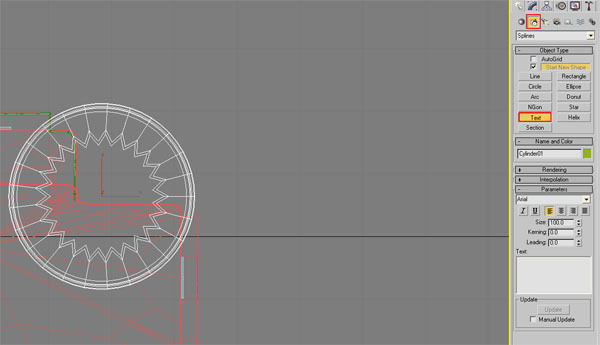 Step 16:then see the result of Mesh Smooth this is looking tribal lets fix it. 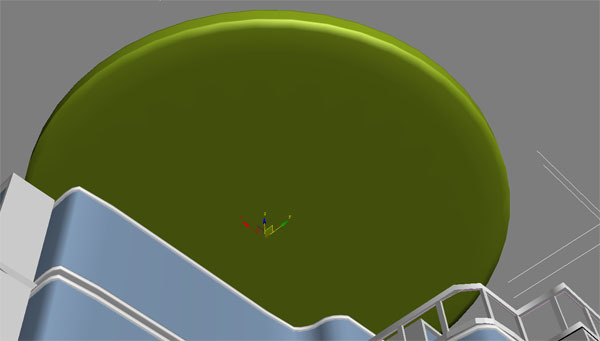 Step 18:now apply the Mesh Smooth and check result. 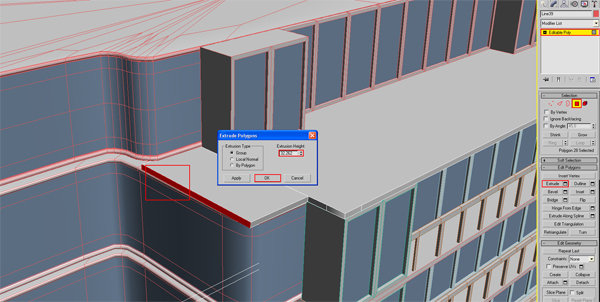 Step 19:now make a new box with windows. 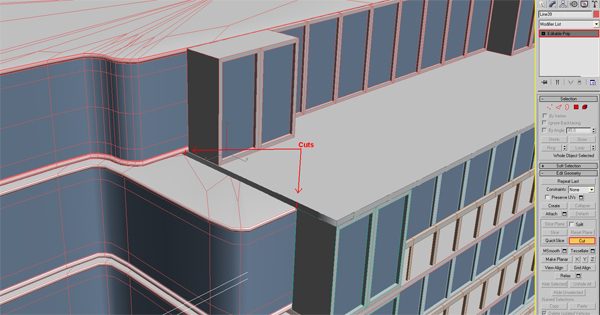 this box will make add more details in our building ,lets see how it works. 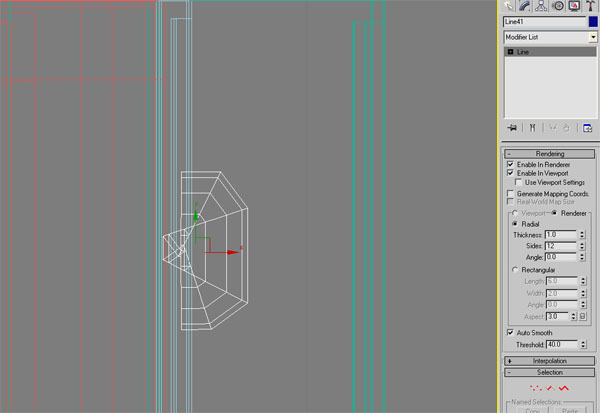 Step 20:right click on the object then convert it to Editable Poly>Edge>select 2 edges from front. and click on Connect with 1 Segment. select 2 faces from front. and click on Inset (1.9). and change settings as like image. 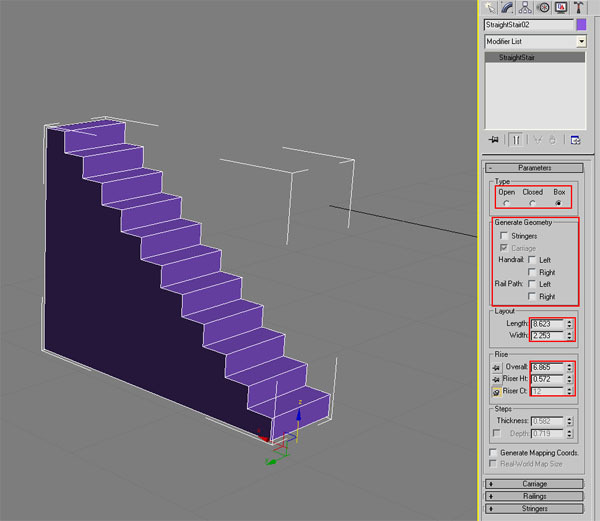 Step 21:Editable Poly>Polygon>click on Extrude (-1.644). Step 22:clone this box 8 time and setup up as like this image. 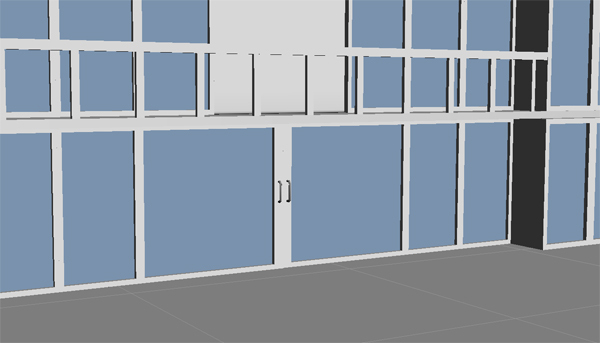 Step 23:now lets make a window and use it for empty places in my ground floor. make a box in same size of our first window but just use one side of window for the dimensions. 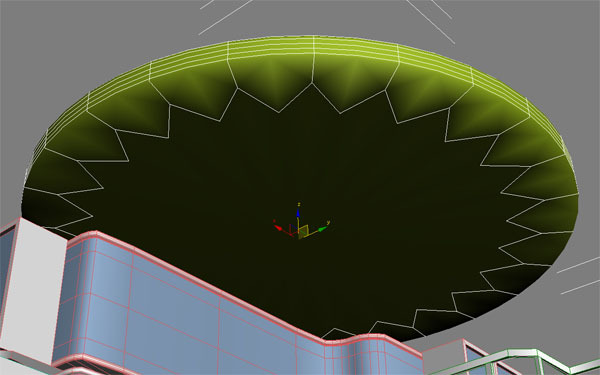 Step 24:Editable Poly>Polygon>select the face and click on Inset (0.21). 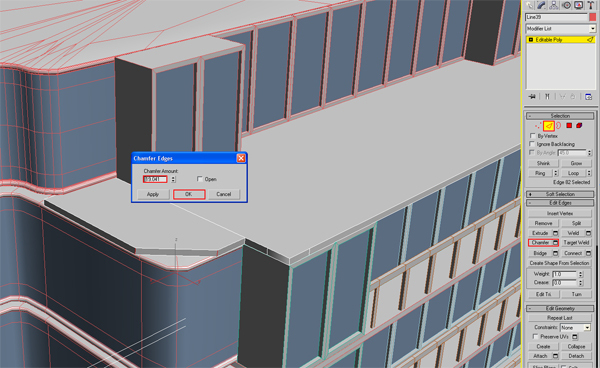 Step 24:now click on Extrude (-0.18) and window is complete. 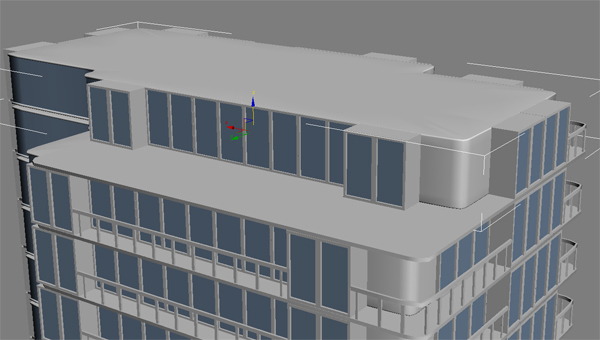 Step 25:now i need to clone this window many time and fill the empty places of ground floor as like the picture below. 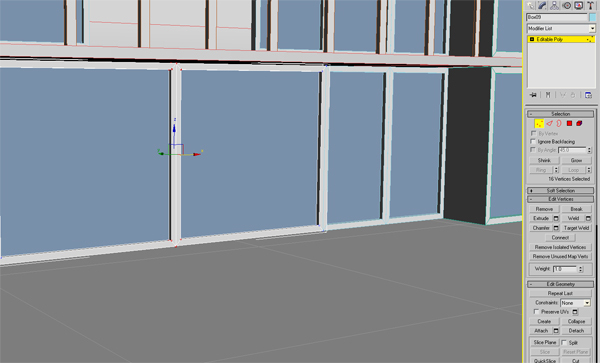 Step 26:now lets make a new windows for this empty place. 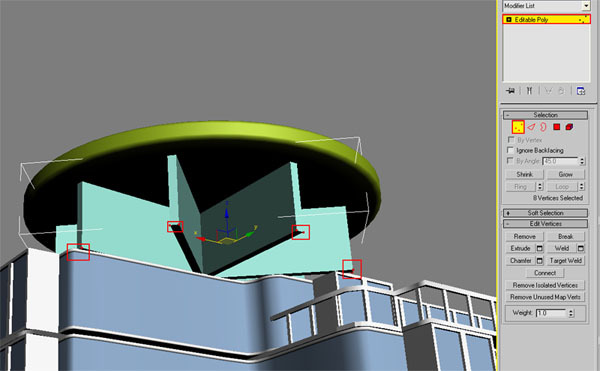 Step 27:go to Editable Poly>Polygon>select the face and click on Inset (1.52). 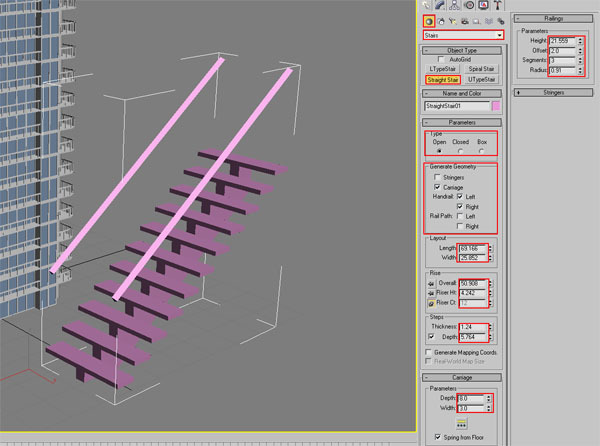 Step 28:now click on Extrude (-1.445) and use the type: Local Normal. Step 29:Inset just one more time (0.41) then check how’s looks. 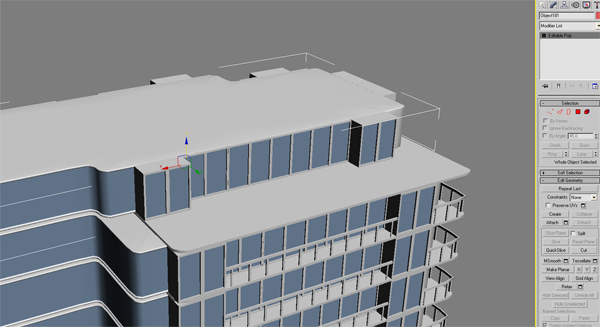 Step 30:now i am going to make a roof for ground floor just right click on the object and select the Unhide All .you will see a shape of the building i hide it in Step 10 . 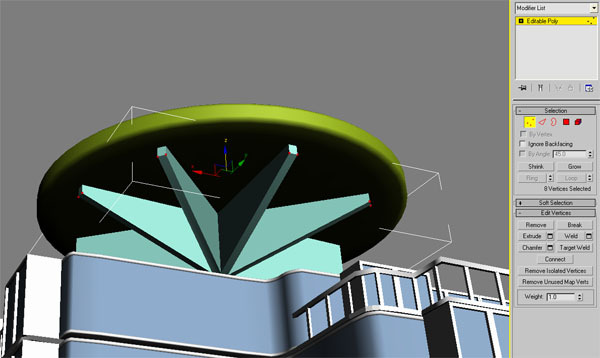 Step 31:that shape need to be scale down as like roof size, now i will make the some changes in roof. 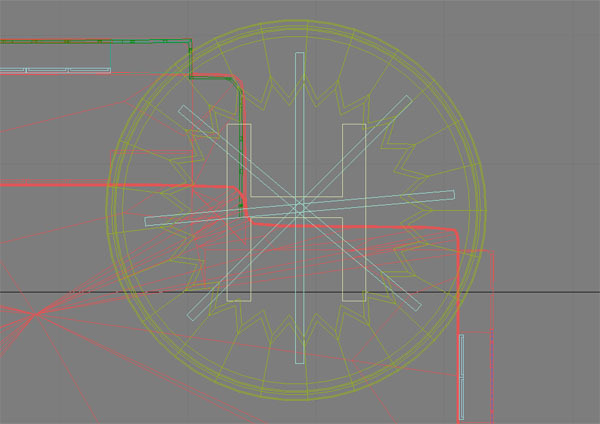 go to Editable Poly> Vertex>and change the vertex position as like pictures. Step 32:apply the color on ground floor. 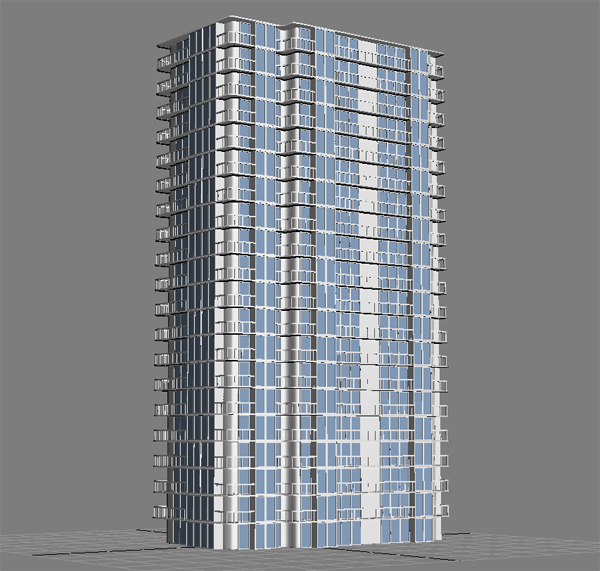 In this tutorial i will show you how to model a high definition building in 3ds Max 9. 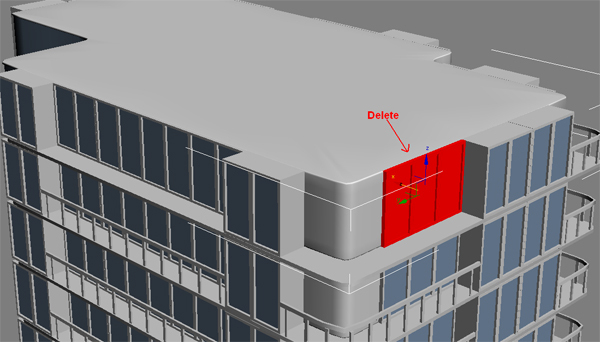 This is part 2 of my tutorial, you still need 3ds max 9 and some High Resolution Images of Buildings and Skyscrapers. You can not start without good reference images, they are important. 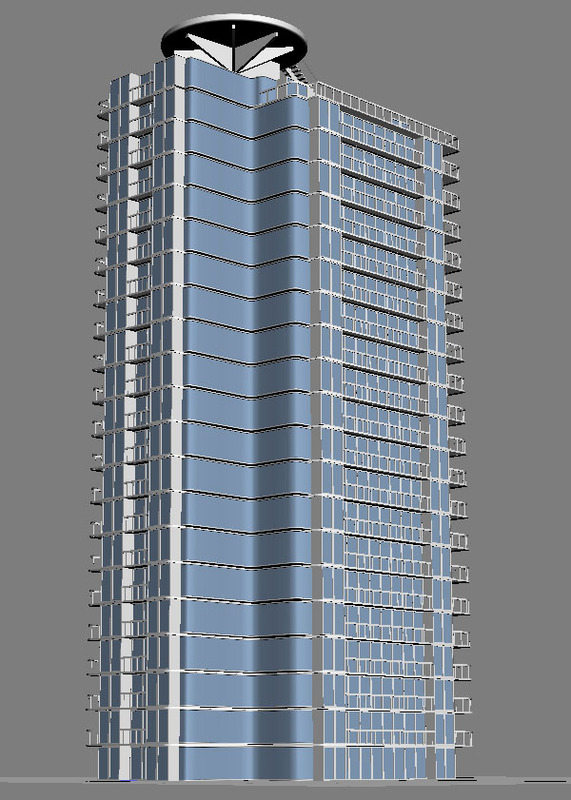 U can get some from http://www.environment-textures.com – you will find high resolution images of buildings there. 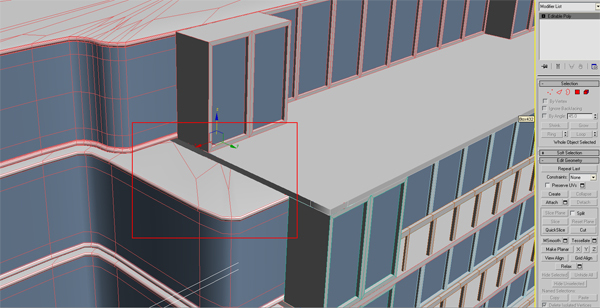 Step 01:select all , clone the ground floor and move it up as like in the picture. 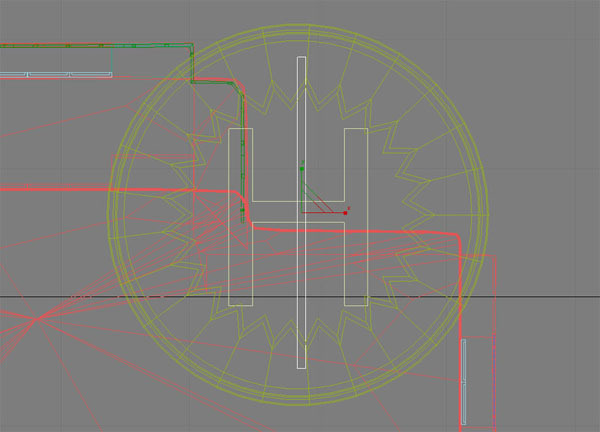 then go to Shapes>Line>and start making line as like area shape. 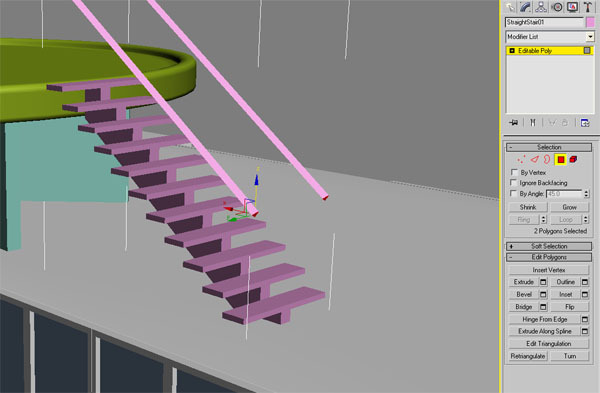 Step 03:Geometry>ACE Extended>Railing >Pick Railing Path>click on Line. 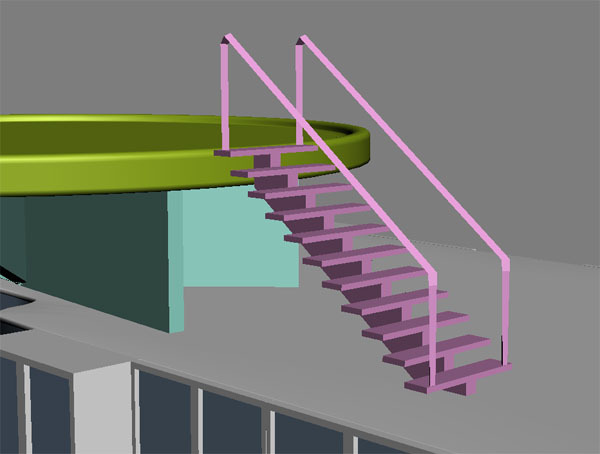 Step 04:just change the Railing color and use the same method for all Railing area in ground floor. 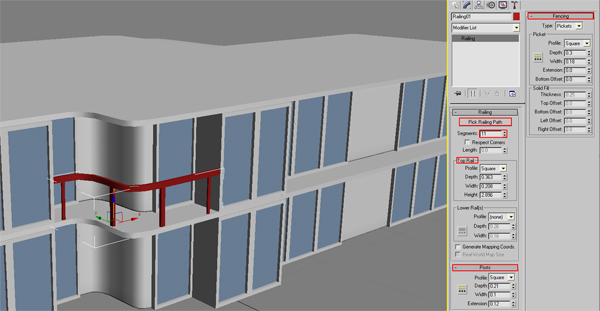 Step 05:Select the first floor and clone it 18 times. 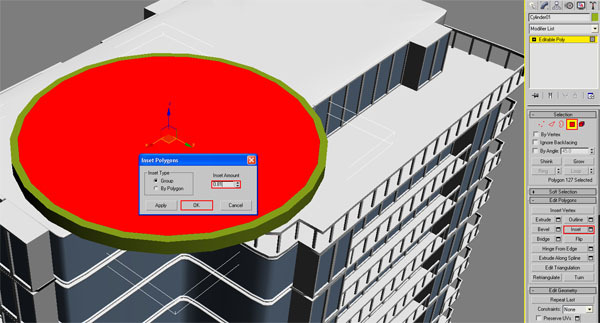 go to Editable Poly> click on Attach and attach both windows. Step 07:start editing in this window for change it in door. 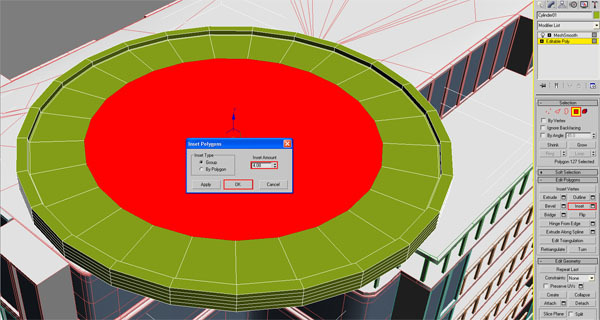 select the vertexes and move close the vertexes position. make some space for the door handle. Step 08: i have completed the door frame lets start the door handle then door will be complete. 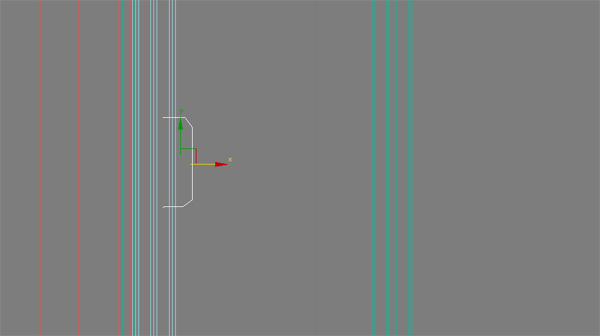 go to Shapes>Line>and make handle shape. 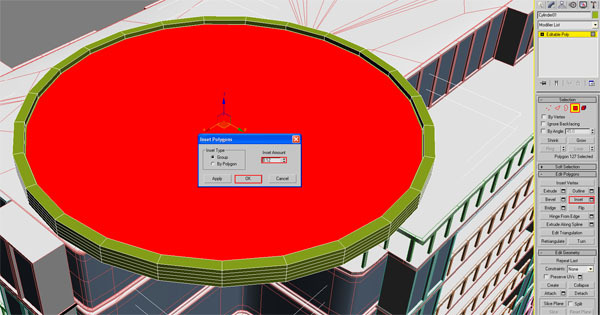 Step 09: go to Modify>Rendering>click on Enable In Renderer and Enable. Step 10: fix the handle on right place and clone it as like picture. 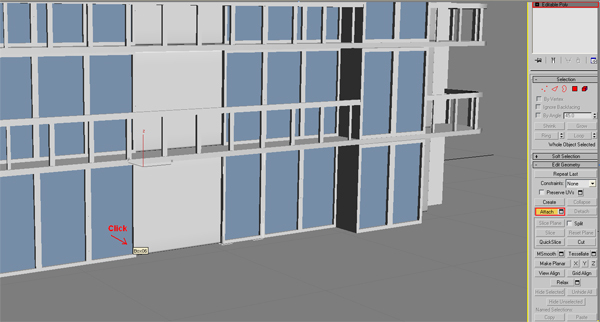 Step 11: ground floor have completed. 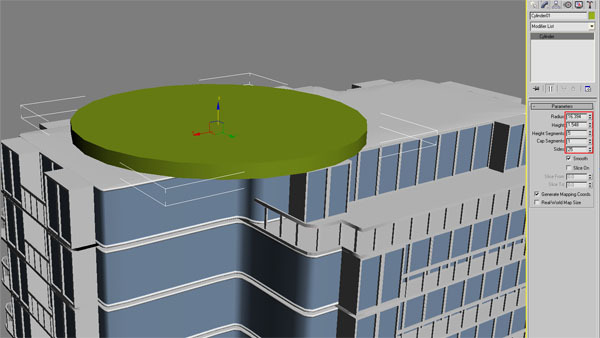 now i will make top floor. 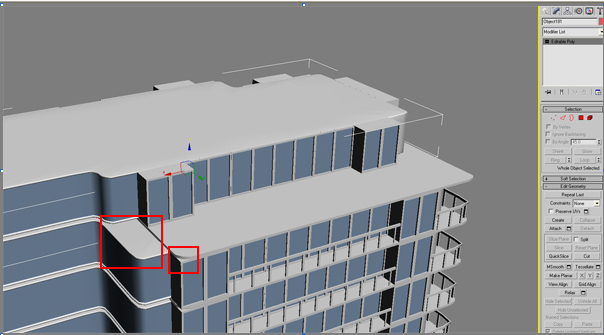 clone the top floor with out roof and attach the all parts of top floor. 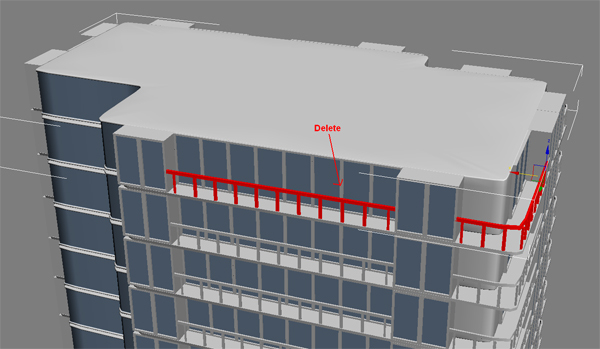 Step 12: Delete these Railing and 3 windows. 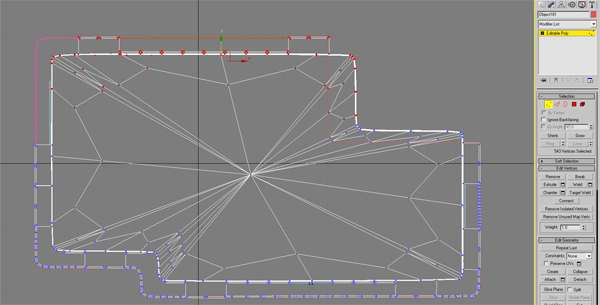 Step 13: Editable Poly>Vertex>select these vertexes and move back as like pictures. Step 16: go to Editable Poly>Polygon>select the face and Extrude (32.262). Step 17: select the Edge>Chamfer (19.041). Step 18: select both edges and Connect with 3 segments. 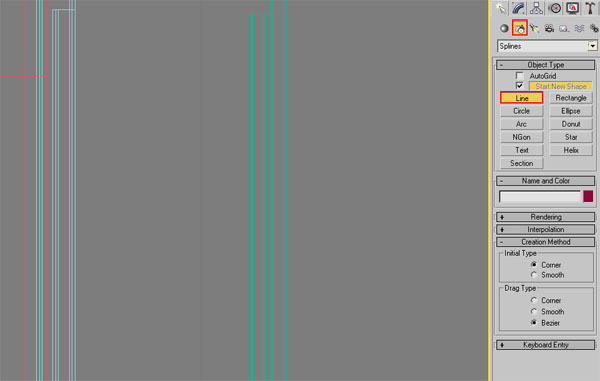 Step 19: set the vertexes position as like picture. Step 20: lets make the Railing with the same method, I did in Step 34. 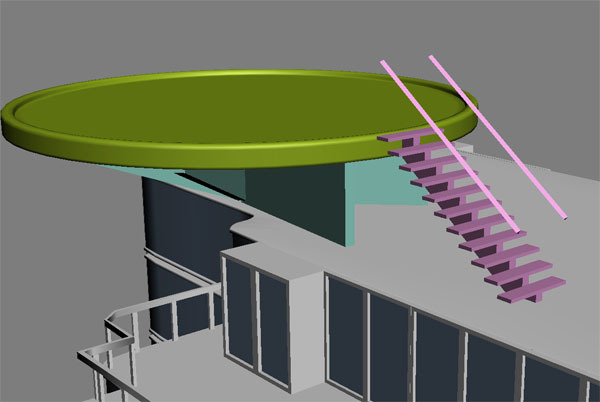 Step 21: i am going to make Helipad and the end of tutorial i will make stairs. 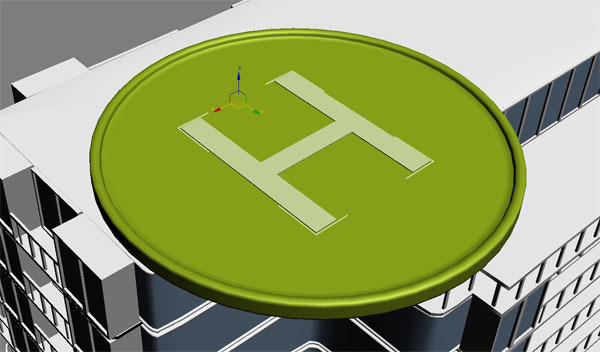 go to Geometry>Cylinder>and make a Cylinder for Helipad base. 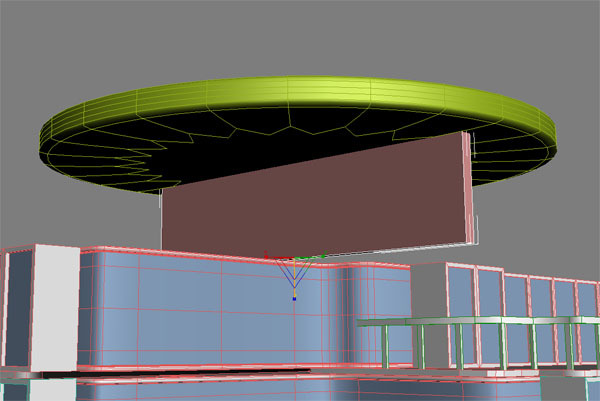 Step 22: right click on the object and then convert it to Editable Poly. 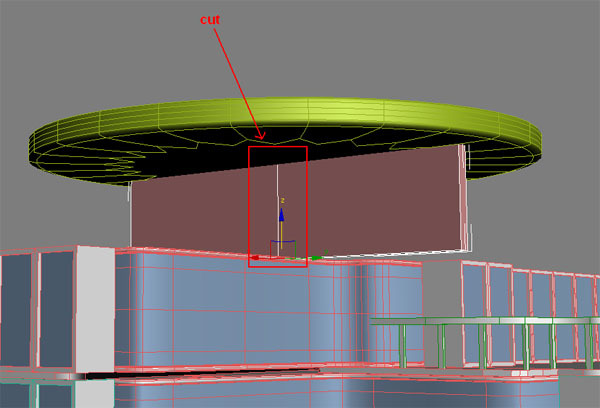 Step 23: Polygon>select the face and click on Inset (0.81). Step 25:Inset (0.12) and Inset (4.08) again one more time. now apply the Mesh Smooth from Modify. 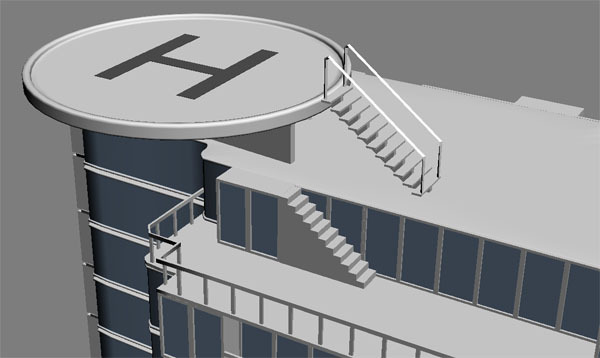 Step 26:bottom of Helipad is looking not not good just Inset (4.08) the bottom one time then it will be fine. 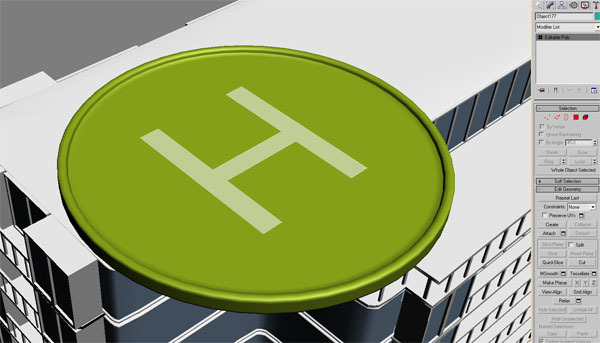 Step 27:now need to make Helipad Logo. 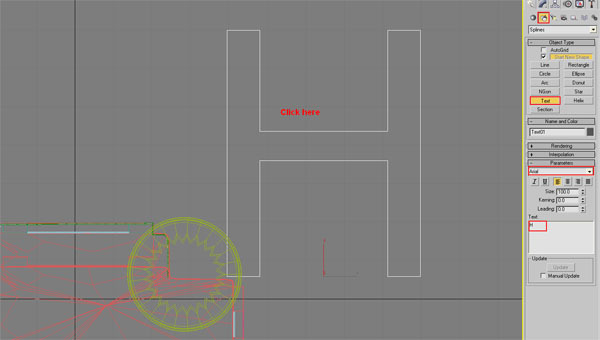 go to Shapes >Text> write H and click on view port. 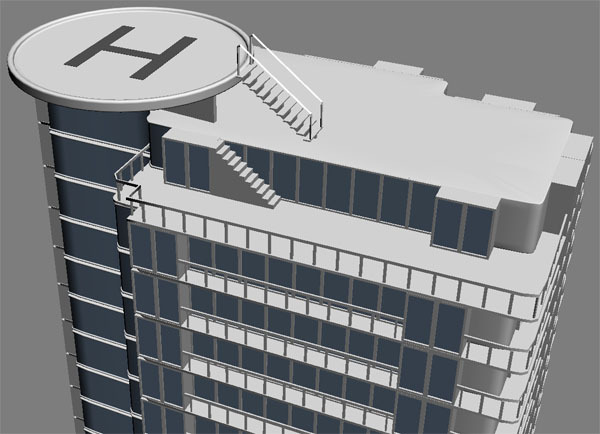 Step 30: now lets make the helipad stand. go to Geometry>Box >make a box shape as like pictures. add one edge in the center of box and change the box color. clone the box 3 times and rotate the boxes position as like picture. now attach the all boxes. 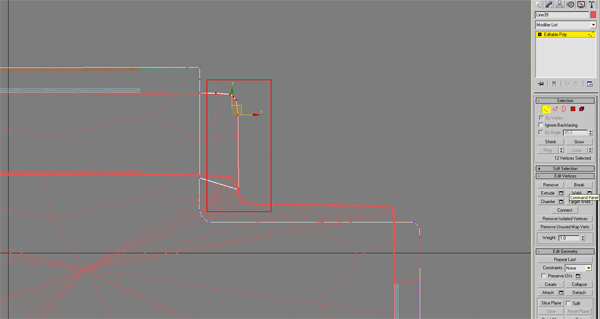 and go to Editable Poly>Vertex>select these vertexes and move up. just scale down the stairs and fix it here. 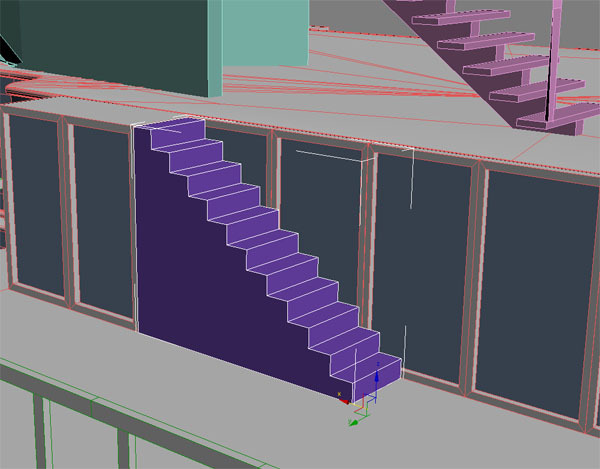 now repeat this method for other side of stairs. 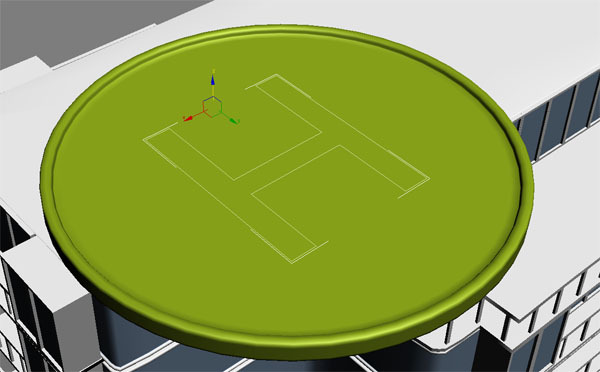 We just completed second part of this tutorial … thanks for reading and good luck modeling.